Be Intentional - Practice gratitude in your own daily life and lead by example when interacting with your spouse, children, and other adults. Modeling the type of behavior you want from your child is the best way to encourage him or her to follow your lead. Be Charitable - Show your children what it feels like to be a gracious giver. Encourage your child to clean out his or her room and donate any unneeded items to a local homeless shelter or church organization. Explaining to your child the purpose behind donating items to those who really need them is a great eye-opening exercise in gracious giving. Be Acknowledging - Encourage your child to acknowledge all that they have been given by frequently discussing what you’re thankful for. Stating that you are grateful for a nice meal cooked by your spouse, time spent with loved ones, money to purchase a new item for the family, etc. 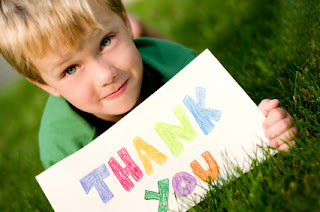 will plant a seed of thankfulness as your child begins to identify specific things for which to be grateful. Be Responsive - Teach your child to respond appropriately to others’ kindness by encouraging him or her to frequently say “Thank you.” Keep a stash of thank-you notes at home and have your child thank others after a gift or service has been given. Grandparents will love getting a handwritten card in the mail after sending a grandchild’s birthday present. Thank-you cards are also great for teachers, coaches, etc. to demonstrate gratitude for their time and commitment. Also see FAIRMONT FIVE: Teaching Good Manners for more etiquette tips. Gratitude equates to a positive attitude and optimistic outlook on life. “When kids recognize that the things they own and the opportunities they have come from someone other than themselves, it helps them develop a healthy understanding of how interdependent we all are - and they may be more inclined to treat others with genuine respect,” says Huffington Post article titled 11 Tips for Instilling True Gratitude in Your Kids. Labels: California, Children, Citizenship, Education, Elementary, Fairmont Private Schools, How To, Learning, Manners, Orange County, parenting, private school. It’s never too early to provide your child with a strong foundation of financial wisdom and guidance. Learning financial principles at a young age will set the stage for a smoother transition into adulthood. From making small purchases with his or her own money to paying for college and beyond, wise financial stewardship is an essential skill. The Forbes article titled “The 5 Most Important Money Lessons to Teach Your Kids” encourages parents to take advantage of teachable moments in order to advise children about personal finance. For example, include your six-to-ten year old when making purchases at the grocery store. Give him or her several dollars and allow the child to make a selection based on parameters you have given (e.g. money must be spent on fruits or vegetables, cost not exceeding the specified amount, etc.). Parents should also remain interactive while shopping with children. Talking aloud and posing questions to your child, such as “Is this item essential?” or “Should we save money by buying an off-brand item instead?,” will keep him or her engaged in the activity and foster the concept that money is finite. 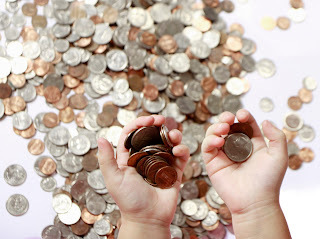 A U.S. News & World Report article, “7 Ways Smart Parents Teach Their Kids About Money,” references CEO of Offers.com Steve Schaffer’s method of teaching his own children about money. When doling out weekly allowances, Schaffer deducts a quarter for “family taxes” and requires each child to put 15% of the week’s money into a savings account. The child may then choose what to do with the remaining amount, which is where a multitude of teachable moments occur organically. For instance, instead of buying the toy that your child has been begging for, encourage him or her to set a goal and save their own money for the purchase. This is a perfect situation for eliminating instant gratification and teaching goal-setting, money saving, and perseverance. As discussed in past blog post “HOW TO: Foster a Strong Work Ethic,” present opportunities for your child to earn extra money by establishing a list of chores to be completed for payment. Another idea to consider is using a clear container instead of the classic piggy bank. This will give your children a visual reminder of their saving and purchasing goals. You can also teach the value of coupons and sales by encouraging your child to hunt for coupons in the newspaper. Also, consider limiting the amount of advertising your child is exposed to when trying to teach money-conscious values. Open a dialogue about advertisements and commercials by asking questions like “Would you spend your money on that?,” “How much do you think that item costs?,” or “Do you think we really need that item?” View past blog post “CHALK TALK: Helping Young Children be Aware of the Purpose of Advertising” for more about parenting in an ad-saturated world. Believe Chores are Necessary - Marie Hartwell-Walker, Ed.D., states in her article Teaching a Work Ethic, that “[parents] need to rethink [their] whole notion of chores. If you think they are optional,... so will your kids. [...] Our kids pick up our attitudes whether we say them or not.” Hartwell-Walker also notes that in order to teach proper work ethic, parents need to believe and exemplify that work is a necessity of life. Model Hard Work - As your child’s foremost role model, lead by example when it comes to completing projects and chores. If you desire your children to put their dirty dishes in the dishwasher, make sure that you’re putting your dirty dishes into the dishwasher. Model to your child that work becomes easier when done thoroughly the first time. Assign Age-Appropriate Jobs - Teach your child to be a contributing member of society by first encouraging him or her to be a contributing member of the family. 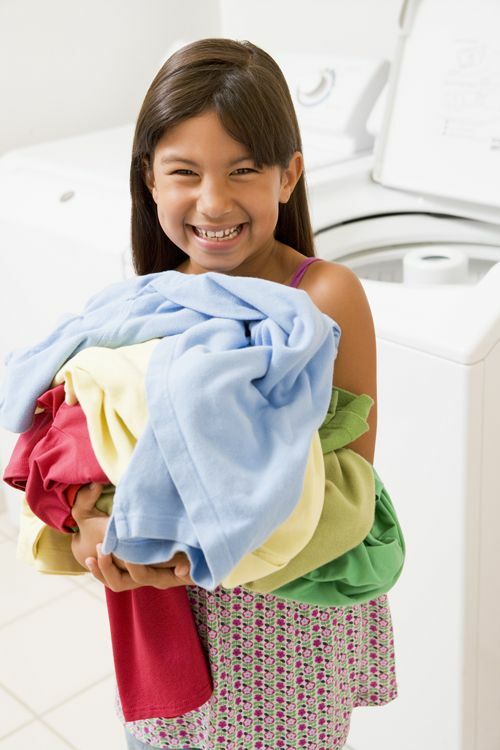 Give each child age-appropriate chores to be completed routinely. Establish the boundary between chores that are required of family members, and those that can be done later for extra pay. 7 Ways to Teach Good Work Ethic While They are Young has more great ideas about assigning chores at home! Establish a routine, develop the understanding that everyone must contribute, and display the consequences of ignored work, to help your child understand the value of contributing to a family and accomplishing a goal as a team. Fostering a strong work ethic in your child will greatly prepare him or her for success in all future endeavors. Sleeping Schedule - Children love summer because of the relaxed bedtime schedule. To encourage a school year bedtime, try getting children to bed early and setting their alarms for a school morning two weeks before the start of school. This will help children acclimate to the new sleeping routine that’s sure to start with the new school year. Family Calendar - Before school starts, gather as much information about sports schedules, class times, special events, etc. and outline everyone’s schedule on a calendar posted in a highly trafficked area of the house. Develop a color-coding system using highlighters or colored pens to help make dates and times clear for each family member. Tech-centered families can use calendar apps, such as iCloud Calendar, Google Calendars, or Sunrise Calendar, to seamlessly coordinate and synchronize schedules. Streamline Cooking - Gear up for back-to-school season by making freezer meals one-to-two weeks before the start of the school year. Prepare as many healthy meals as possible before the new schedule sets in. Don’t forget that freezer meals are not just for dinner, but breakfast, too! Check out Fairmont’s Snacktime Pinterest board for great freezer meal ideas! Fall Cleaning - Start the school year off with a clean house! After the upheaval of family vacations and summer activities, take time to put away all items and clothes that won’t be necessary during the fall and winter months. Clean up areas of the house that become easily cluttered, and try out a new organizing system with color-coded paper files, whiteboards, storage bins, etc. Don’t forget to clean out the family car before carting kids to and from school and events. Sibling rivalry: it’s as old as time itself. Competitive attitudes between siblings is natural. As a parent, dealing with children who are constantly challenging each other can be a taxing battle. Extinguish rivalry fires around your house with these helpful tips! Do not show favoritism toward your children - While the child who is on the receiving end of his or her sibling’s aggression may be your favorite at the moment, do not show partiality. This will only intensify the siblings’ desire to fight for your attention. Refrain from talking to one child about the other - An extension of tip number one, parents should never discuss a child’s poor choices with the opposing sibling. This will only fuel the fire and provide a poor example of how to fight fair. Be inclusive of older children - After the novelty of a new baby wears off, and you devote more time to a smaller child, your older children may feel as though they have fallen down the family pecking order. Encourage your older child to participate in making small decisions regarding the younger child (e.g. allow them to pick out a food item or outfit while shopping for the baby). Actively listen to your children’s struggles - Allowing them to individually express their problems shows that you care and respect what they have to say. This will encourage your children to become good communicators and result in a peaceful household. 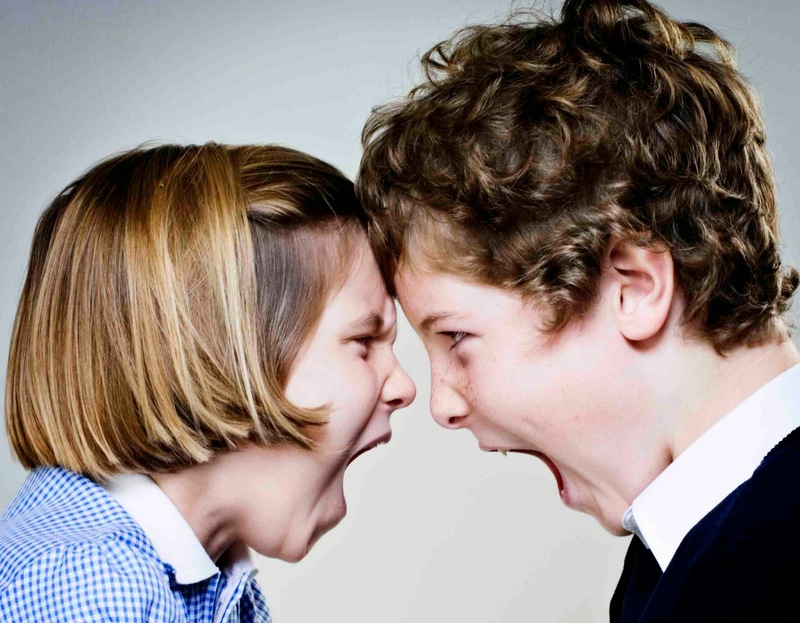 The dueling siblings will ultimately learn to handle disagreements in a less aggressive manner. Siblings at War in Your Home? Having a daily routine of reading, writing, and practicing math facts at home significantly helps a child prepare for the next grade level. Here are some recommendations for parents to help their children confidently make the transition. -Encourage your child to read books that appeal to his/her interests. For children who cannot yet read on their own, being read to aloud by an adult or older sibling is a wonderful way to finish a busy day. 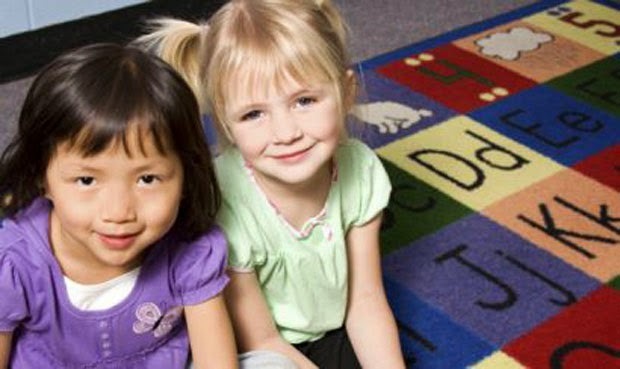 -Talk positively about math with younger children and provide examples how addition, subtraction, multiplication, and division are tools for solving everyday problems. Explain how math helps figure out the cost of going out for lunch, save money for purchasing a toy, and determine the cost of groceries during a trip to the market. -Accelerated Math (AM): For older children who have a strong grasp of their basic math facts, AM is a great way for expanding their mastery of mathematics. It enables them to review a variety of math topics in order to remain current. -Writing is an accrued skill. Steady practice results in better writing. Parents can help their younger children foster a love for writing by encouraging them to write in a journal every day. Keeping these journal entries will help track the progression of writing skills over time. Along with assisting in practicing academic skills, it’s equally important for parents to remember that encouragement and assurance go a long way to helping their children prepare for the next grade level. As Fairmont students become familiar with the routines of school and carrying their backpacks, we would like to offer sound advice for parents to help their children use backpacks properly. The American Academy of Pediatrics and the American Occupational Therapy Association have provided helpful tips on backpack safety. The backpack should be appropriately sized for the student to use comfortably. It should have enough room for necessary school items and have wide, padded shoulder straps as well as a padded back. Adjust the shoulder straps so that the pack fits snugly on the student’s back. A backpack hanging loosely from the back will strain muscles. Slinging a backpack over one shoulder can also strain muscles. Your student should always use both shoulder straps. Organize the backpack to use all of its compartments and pack heavier items closest to the center of the back. Try to arrange books and materials so they will not slide around. The backpack should never weigh more than 10 to 20 percent of your child’s body weight. Please feel free to share your thoughts on this topic and provide additional tips that will help students have an enjoyable and rewarding learning experience at Fairmont Private Schools. Please click here for more information regarding proper backpack use. Limericks are one of the most fun and well-known poetic forms. No one knows for sure where the name “limerick” comes from, but most people assume it is related to the county of Limerick, in Ireland. The reason limericks are so much fun is because they are short, rhyming, funny, and have a bouncy rhythm that makes them easy to memorize. In this lesson, I’ll show you how you can write your own limericks in just a few easy steps. They are five lines long. Lines 1, 2, and 5 rhyme with one another. Lines 3 and 4 rhyme with each other. They have a distinctive rhythm. Who fell in the spring in the fall. But he didn’t—he died in the fall. Notice that the words, “Hall,” “fall,” and “fall” all rhyme. Those are the “A” words in the “AABBA” rhyme scheme. Also notice that “thing” and “spring” rhyme. Those are the “B” words in the rhyme scheme. Choose the name of a person or place and write the first line. Look in a rhyming dictionary for words that rhyme with your person or place name. Write line 2 and 5 to rhyme with the first line. Now write lines 3 and 4 with a different rhyme. When you are done writing, read your limerick out loud to see if it has the right rhythm; three “beats” on lines 1, 2, and 5, and two “beats” on lines 3 and 4, as shown above. If not, see if you can rewrite some words to get the rhythm right. Have fun writing your limerick!